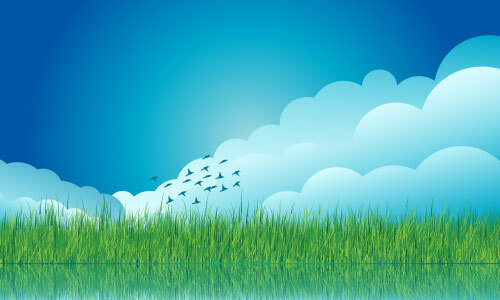 After studying this cloud and grass tutorial, you will learn many useful and necessary techniques that will help you to create an eye-appealing wallpaper quickly and effectively. We’ll cover on how to use shapes and gradients to achieve a simple landscape environment. Let’s get to it! 1. Open up a new document and set the dimensions of the Artboard to about 800 x 600px. Then, using the Rectangle Tool (M) create a rectangle whose dimensions match the size of the Artboard itself. 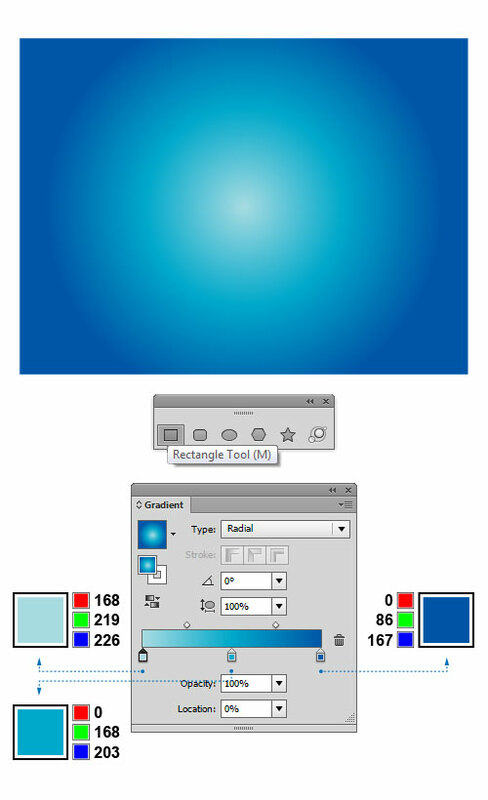 Open up the Gradient Panel and fill the resulting shape with radial gradients: light turquoise (R=168, G=219, B=226), medium turquoise (R=0, G=168, B=203) and medium blue (R=0, G=86, B=167), as shown below. 2. Let’s create our first cloud. Grab the Ellipse Tool (L) and create four circles of different sizes. Select all and in the Pathfinder Panel press the Unite button, in order to merge the shapes. With the Rectangle Tool (M) selected, create a rectangle over the lower part of the circles and in the Pathfinder Panel click on the Minus Front button to remove the bottom part of the clouds. While the object is still selected, fill the resulting shape with radial gradients as follows: medium turquoise (R=0, G=168, B=203) and light turquoise (R=217, G=251, B=255). Now place the cloud over the background, as shown below. 3. Using the techniques we described earlier, you should create several more clouds, which makes the entire illustration more interesting. First, create another cloud as we did in the previous step and place it on the other side of the background. Open up the Gradient Panel and apply some linear gradients to the object: Repeat this step for as many clouds as you want. When you create the clouds, just be sure you create some of them larger and some of them smaller. if you want to change the stacking order of the clouds, use the Send Backward (Ctrl+[) command. This command move the selected object back one step at a time. 4. Let’s create some flying birds in the sky. Pick the Pen Tool (P) and draw a simple bird silhouette. Go to Color Panel and set the fill color of the selected object to dark blue (R=3, G=118, B=146). Then, draw two more bird shapes with different wing movements. Make a copy of each bird and arrange them randomly, so that it looks like flock of birds flying through the scene. 5. Let’s create some lush grass, in order to enrich the illustration. Grab the Pen Tool (P) again and draw several paths, which differ in size and direction in which they are set. Select all paths and in the Stroke Panel choose the ‘Width Profile 4’, which gives you a nice blade of grass. Go to the Color Panel and use different shades of green to color the objects. Once done, group the objects (Ctrl+G). While the objects are still selected, in the Brushes Panel click on the New Brush button. Pick the Scatter Brush option to open the dialog box. 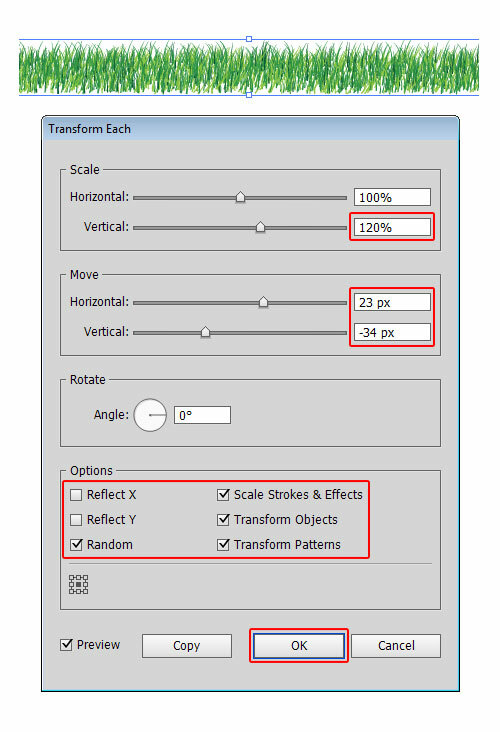 When the Scatter Brush Options appear, enter the values shown in the image below and confirm with OK. In the Brushes Panel, choose the brush we have already created and using the Line Segment Tool (\) draw a straight horizontal line. As you drag, hold down Shift to constrain the line horizontally. 6. Since we got a lawn with uniformly ‘cut’ grass, we have to make it look more real. Keep the path selected, and go to Object > Expand Appearance in order to expand the object. You need to ungroup the objects (Shift+Ctrl+G) twice, until you have those blades of grass individually separated. To randomize the grass position, select Object > Transform > Transform Each and the dialog box will appear. There is no exact numbers – in the ‘Scale’ section I’ve changed the vertical scale to 120%, and entered 23px Horizontal and -34px Vertical in the ‘Move’ section. Play with sliders until you like the result and the grass looks random enough, and hit OK to apply the transformation. 7. 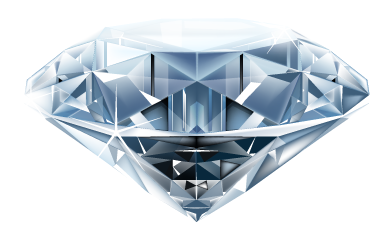 Keep all the transformed objects selected, and go again to Object > Transform > Transform Each. All of your existing settings should be unchanged, but this time confirm with Copy. By using the Transform Again (Ctrl+D) command, you can quickly repeat the last transformation on our selected objects. Repeat this until you fill the gaps in grass. As you can see, there is some extra grass there that need to be erased. Select the entire grass, then grab the Eraser Tool (Shift+E), hold down the Alt key and erase the extra bottom area (see image below). To increase the height of the grass, grab the top-middle bounding-box handle and drag it upwards, until you get the desired height. Finally, place the grass where you feel it looks best. 8. Select all objects we created so far (except the sky), and choose Object > Transform > Reflect and click Copy to reflect the objects along the horizontal axis. Once done, place the reflected objects the way you can see in the image below. Reflections in water tend to distort objects, so it would be best if you shrink everything a bit. To simulate a water surface, create a rectangle over the upper part of the reflected objects. Open up the Gradient Panel and fill the resulting shape with linear radients: light turquoise (R=217, G=251, B=255) and medium turquoise (R=0, G=168, B=203). Now make a copy of the rectangle from Step 1 and place it on top using the Bring to Front (Shift+Ctrl+]) command. Select everything and go to Object > Clipping Mask > Make (Ctrl+7) to mask out the parts that exceed the boundaries of the rectangle. That’s it. I hope you’ve enjoyed reading this tutorial.